Photons carry momentum, and this momentum delivers a force to any object that refracts a beam of light. An optical trap uses a beam that is sufficiently intense and tightly focused that its forces can capture and move small particles under a microscope. In the years following its demonstration by Ashkin in 1970, optical trapping has had dramatic impact on the field of biological physics: it allows experimenters to measure the tiny forces associated with individual cells and biomolecules, including the forces generated by the molecular motors that drive the swimming of bacteria and the transport of materials within a cell. Individual cells and their internal components can be probed and manipulated with precision and non-destructively. Working with an optical trap provides an intriguing introduction to the world of experimental biological physics. The theory and practice of optical trapping (also called laser tweezers) have been developed to a high degree. However the basic physics is readily understood by reference to familiar concepts from optics, mechanics and statistical physics. The force provided by the focused light beam acts like a Hooke’s Law spring to pull the particle into the beam focus. In this workshop we use a component-based optical trap design that employs an infrared diode laser beam and monitors the displacement of the trapped particle with a quadrant photodetector. 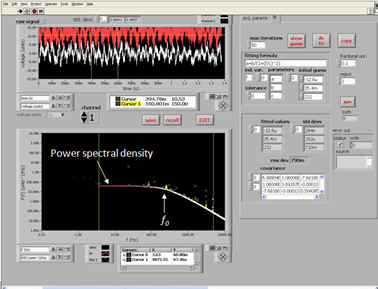 Participants will learn the layout and optical alignment of the trapping apparatus, and will then measure the forces generated by the optical trap. This is done by measuring fundamental physical behaviors of particles within the trap, including the frequency spectrum of their Brownian movement and their response to hydrodynamic drag. Participants will then use the optical trap to measure the propulsion force generated by a swimming bacterium or by a biomolecular motor operating within a plant cell. Thanks to current NSF funding we are able to provide financial support to offset the costs of registration, housing, and some travel for workshop participants. All materials and laser safety training will be provided. Participants should bring a laboratory notebook.